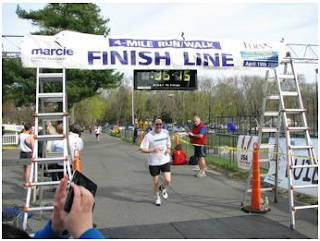 This morning I completed my first race, a 4-mile run through and around Huntington, NY. I had anticipated this for quite a long time and the excitement built as I edged into the weekend. 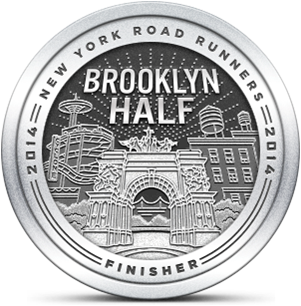 My goal was to finish with an overall pace below 9:00/mile and I was pleased to have done that. I ran the course at 8:50 per mile and I finished the second two miles slightly faster than the first two. The day began with a Kid's Fun Run and both of my kids participated. It was about a quarter mile race that ended at the same finish point as the big race. All the participants received medals and I was proud that my kids were part of the event. As soon as the Fun Run completed, I made my way to the starting line that first involved a trudge up a big hill. When I got to the line I saw that this steep road was actually the route off the line, so at least the start would be downhill. As we lined up and waited I spent time looking at my co-runners, wondering who had raced before and who (like me) was racing for the first time. I also noticed the outfits that people were wearing. Asics and New Balance were definitely the most popular shoe choices and I was surprised to see so many people wearing jackets and multiple layers since the temperature was in the high 40's. I was originally planning to wear a Nike Fit Dri shirt that AG had given me but I had washed and air dried it and it was still damp when it was time to leave. Instead I wore a different technical shirt and my new running shorts. I was cold but I knew that after a mile I would start heating up. I had a tracking chip from the race around my ankle and I brought my Garmin foot pod which helped me keep track of my progress as I ran. Coming off the starting line downhill, many people were whizzing past in what seemed to be unsustainable paces. That's relative to their conditioning but I had decided to run my own race and I held back in anticipation of the BIG HILL that I knew would come at the half mile mark. I learned today that I had not properly trained on real hills, this was quite a challenge both because of the grade of the hill and the fact that we would be ascending it for close to a mile. I was glad that I had studied the course before the race so I knew what to expect in terms of path and direction. Although my Garmin told me how much distance I had traveled, it was the understanding of where I was on the course, relative to the finish, that underscored the amount of work ahead. Volunteers along the course shouted out cumulative distances at each mile point and I was encouraged to know that I was beating a 9:00 pace, which was my goal. As we drew closer to the finish I considered pouring it on with everything I had but then, like a cruel joke, I encountered another big hill with a little more than half a mile to go. It was a struggle getting up that incline but somehow I managed and came around to the sound of spectators cheering us on toward the finish. I was really ready to stop by that point and as I came around the last corner I pushed it up the slight rise that led to the finish line and crossed the line to the loud cheers of my wife and kids. I was immediately asked for my timing chip as a race volunteer handed me a bottle of water. Some minutes later we saw that they had posted the results and I made my way over to see how I did. It wasn't a big field of runners and I finished mid pack but I did place in single digits for my age group. The thing that matters most is that I ran my race, achieved my goal and had the strong support of friends and family. Plus, I won a $50 gift certificate to a local restaurant because it was my birthday! Congratulations!! A nice birthday indeed. Thanks! Great seeing you all this week. Excellent! Great job-- I knew you'd do well -- and happy birthday! Thanks. It was a great birthday and seeing my kids run was a great present. Although I had a great time I'm very glad to be past this race. Now I know what to expect for the next one.